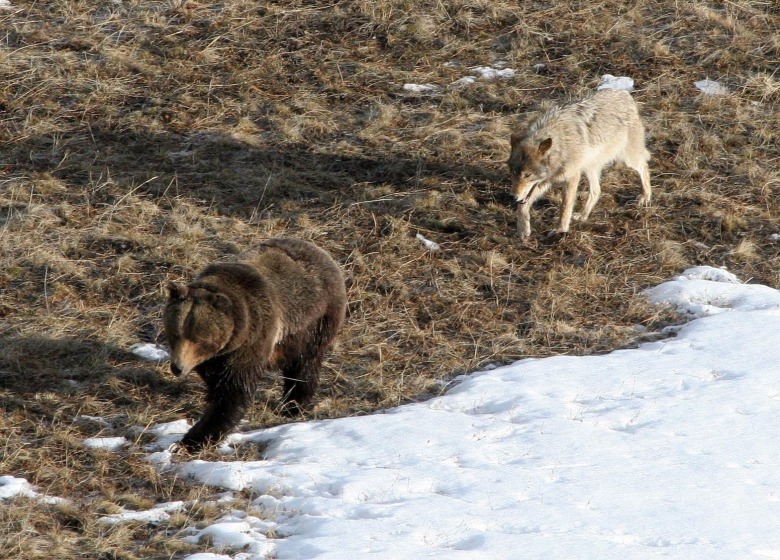 Worth more alive than dead—Yellowstone's top two wild apex predators (Ursus arctos horribilis and Canis lupus) are pillars of wildlife watching. In a survey completed a few years ago, 94 percent of visitors, when asked what they most wanted to see in coming to Yellowstone, said "bears." That was more than those who wanted to see Old Faithful Geyser erupt. In addition, and led by the cadre of citizen wolf watchers in Yellowstone's Lamar Valley, spotting lobos is also a vacation-making experience for many travelers from around the world. Nature tourism contributes more than $1 billion annually to the regional economy of the Greater Yellowstone Ecosystem just in visitation to Yellowstone and Grand Teton national parks alone, but having living grizzlies and wolves on the landscape holds value (beyond dollars) that is inestimable. For sense of place. For seeing rare expressions of wildness. And for making spaces for such creatures in the West after frontier-era attitudes led to the near-destruction of almost all wildlife. In the Yellowstone region, the value of sustainable, non-consumptive wildlife watching dwarfs the revenues generated from trophy hunting. To find tips for safe/responsible viewing of wildlife, click here.